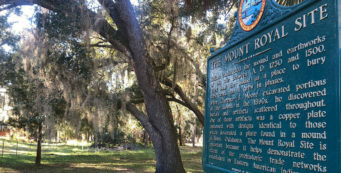 Poisonous trees in Florida | Florida Hikes! Poison ivy. Poison sumac. You’ve probably heard of these, but how about poisonwood? Or manchineel? Some of South Florida’s forests harbor these toxic native trees that you need to learn to identify before you go wandering into the woods. But let’s get the basics of our irritating plants down first, since five of them are related by one thing, urushiol, an oily resin that can irritate your skin. Allergic contact dermatitis, as your doctor will call it, is the primary problem caused by urushiol. Only a billionth of a gram can cause a reaction in some people. Some people have no reaction to small doses of urushiol at all. Poison ivy. Note the red stem and three leaves. If you’ve grown up playing in the woods, you’re probably very familiar with poison ivy. It causes more skin rashes than any other plant in Florida because it contains urushiol. Some people are only slightly affected by poison ivy, while others have massive itchy outbreaks if they brush against it. I learned the hard way – clearing an acre of it with my father many decades ago – than even if you aren’t sensitive to poison ivy, you can become permanently sensitive to it if you touch enough of it. Poison ivy (Toxicodendron radicans) grows both as a ground cover and as large vines that climb trees and almost mimic hickory leaves in their size. 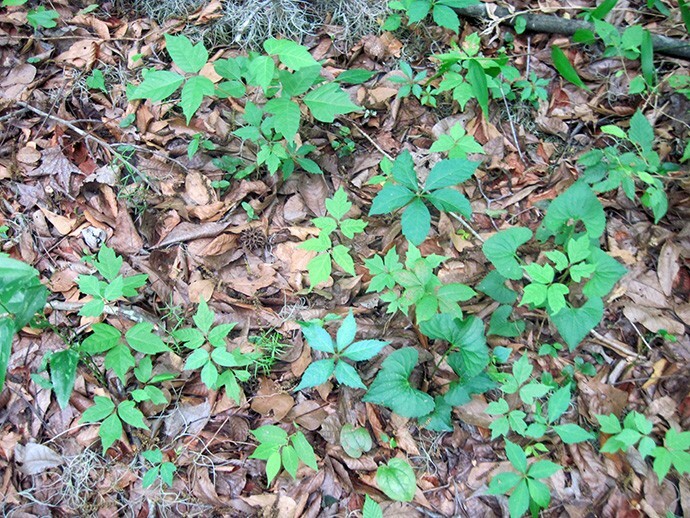 It is found everywhere in the state, but some habitats are more poison ivy-rich than others. It likes the deep shade of hardwood hammocks and tropical hammocks, but we’ve also seen it pine flatwoods and floodplain forests, too. 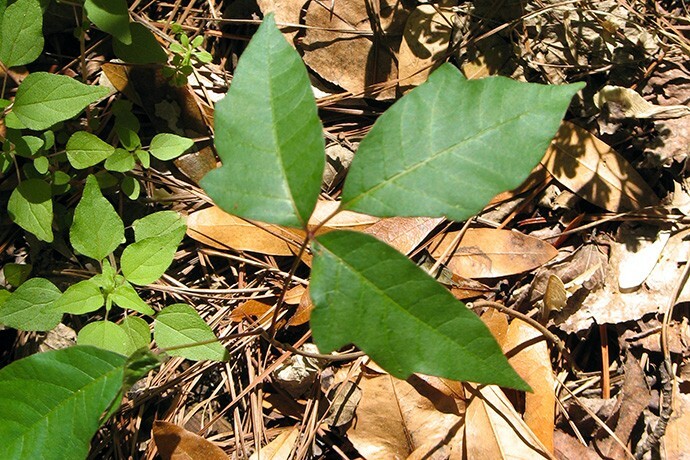 Poison oak (Toxicodendron pubescens) is a small shrub that has the same structure as poison ivy – remember “leaves of three, let it be.” It can grow up to a few feet tall and it looks a lot like a small oak tree, as the leaf shape mimics an oak. 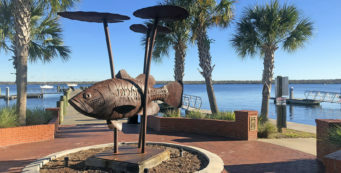 While it’s common in other states, you’ll only find it in North Florida, from Levy and Marion counties through the Florida Panhandle. Poison sumac (Toxicodendron vernix) is found from Central Florida north. You may be familiar with the rather common winged sumac found in sandhill habitats. Liked winged sumac, poison sumac leaves start turning reddish-orange in the fall. But these shrubs are taller and have reddish stems. Now we get into the mean stuff. And by mean, we mean deadly. Both poisonwood and manchineel are native trees, but they are downright dangerous. The endangered white-crowned pigeon eats the plums that grow on both trees, but you can’t. There’s a reason the fruit of the manchineel was called the “little apple of death” by Spanish explorers. A taste of these caustic fruits could kill you. 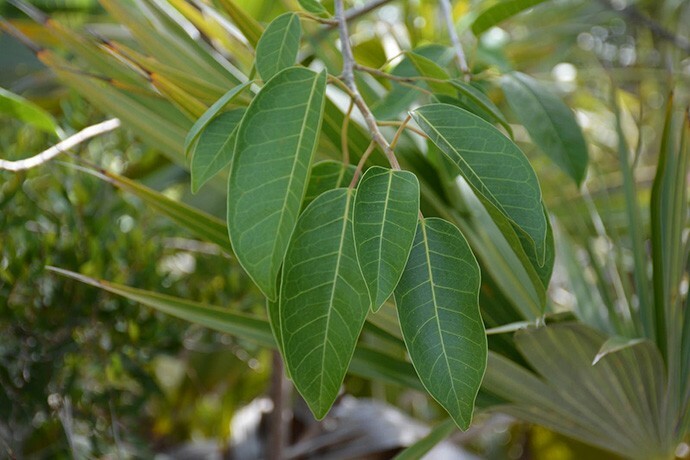 Poisonwood (Metopium toxiferum) is found from Key West north to Stuart and across the Everglades and Big Cypress. 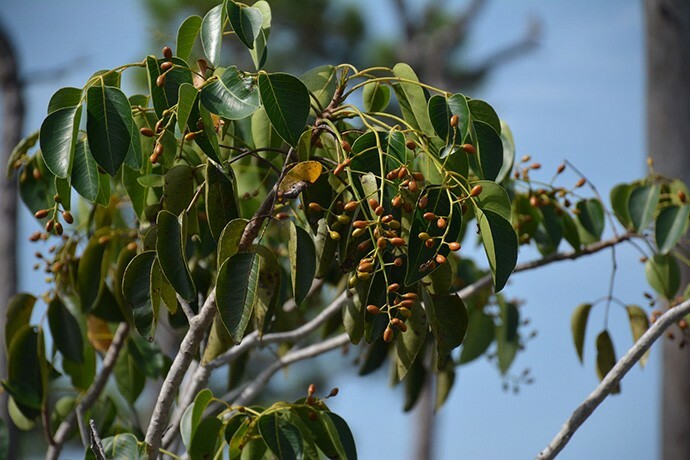 You’ll find poisonwood growing along the trails of Everglades National Park, Long Key State Park, National Key Deer Refuge, along the Overseas Heritage Trail, and in dozens of other natural lands in Southeast Florida. As you might guess by its name, you do not want to touch this tree. I’ve been told that the urushiol in poisonwood bark, sap, and leaves is 100 times more potent than poison ivy. It’s smart to avoid hiking in the rain in tropical hammocks because you do not want the sap dripping on you. Poisonwood bark. Mature trees have these oozing spots. Identifying mature poisonwood is relatively easy. The trunk of the tree has weepy black spots like oil is leaking out of the trunk. That’s urushiol seeping out. In both mature and young trees, the bright green leaves are droopy like the tree hasn’t seen enough rain. Each leaf is tipped with a bright yellow rim around it. Manchineel (Hippomane mancinella) grows in the Florida Keys and Everglades. Every part of the manchineel tree is poisonous. Contact with this tree can be fatal. 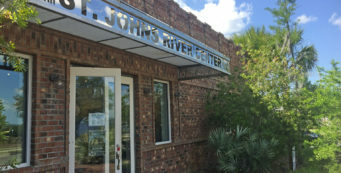 More than a decade ago, a ranger warned me about manicheel in the Everglades with a story of a hiker who had walked beneath a tree along an unmarked backcountry trail and was temporarily blinded by a brush of leaves against his face. That trail has since been marked off limits. 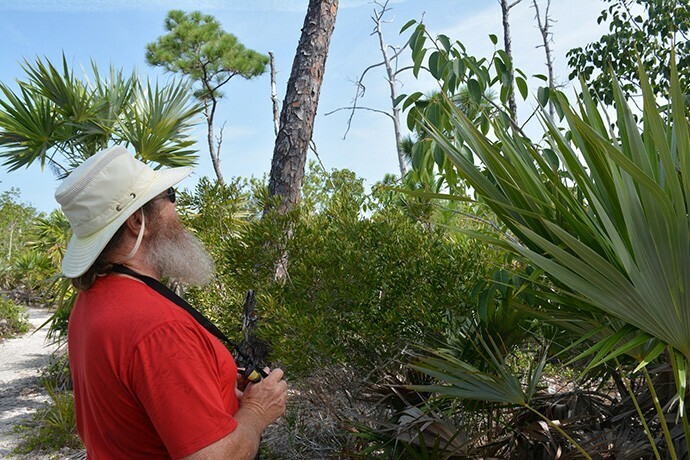 A ranger at Key Largo Hammocks Botanical State Park similarly pointed out its dangers. We’ve seen manchineel in both parks and at National Key Deer Refuge. Manchineel up close. Taken with a long lens. Manchineel is part of the Euphorbia family, which includes poinsettia. A milky sap oozes from this tree and its leaves. 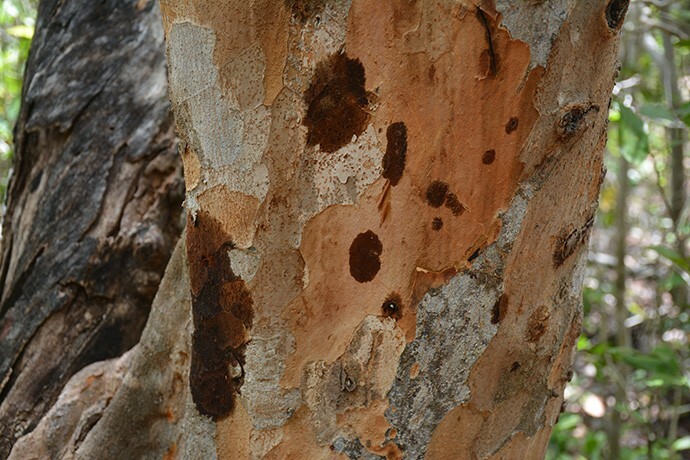 It’s thought that Carib Indians tipped their poison arrows with the sap. 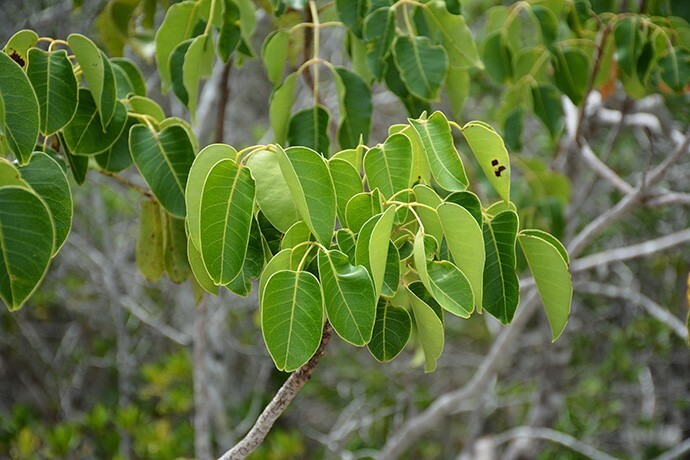 It is the most toxic tree known in the Americas, and is found from Southeast Florida south through Central America. Unlike poisonwood, where you need to have touched oozing sap or a broken limb or leaf to irritate your skin, manchineel is simply nasty all over, all the time. Don’t ever stand under one if you can help it. If you accidentally touch either tree, immediately seek medical help. Again, ingesting the fruit can be fatal. If either of these toxic trees is in your yard and you don’t want it there, don’t try to remove the tree yourself. The sap can harm you, and the smoke from burning the limbs can cause extreme lung and eye irritation to the point of blindness. Call for an expert arborist for help with removing these trees. If you are sensitive to poison ivy, there is a good chance that mango trees, cashew trees, ginkgo trees, and the invasive Brazilian pepper found throughout Florida will also irritate you. All of these contain varying amounts of urushiol. We had a friend who was very sensitive to urushiol, and he could not eat cashews or mangoes as he would break out in a rash. Note the poisonwood tree behind the sign along the Overseas Heritage Trail. Why not to bushwhack in the Florida Keys! If you know you have serious sensitivity issues like that, avoid hiking in areas with Brazilian pepper and anywhere posted by land managers as having a large number of poisonwood trees. 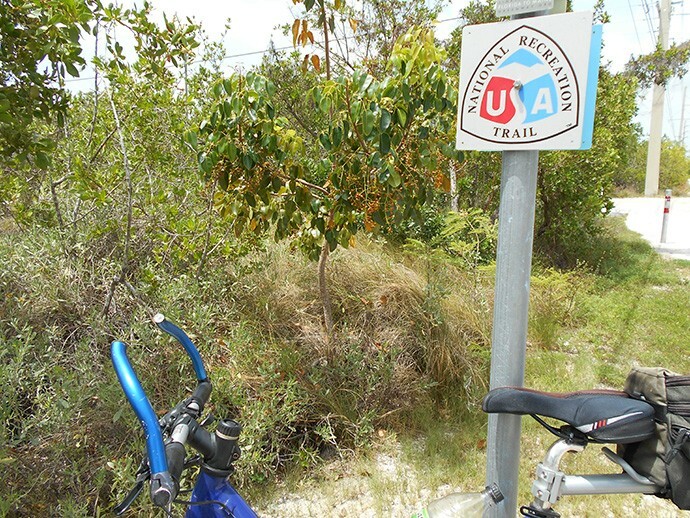 That includes most of the natural-surface nature trails in the Florida Keys. 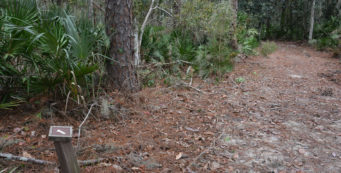 Paved trails like the Overseas Heritage Trail and the broad paved loop at Key Largo Hammock provide more of a buffer from these trees. Extremely interesting content and replies. The Spanish called the manchineel tree the “manzanilla de la muerte”, or “Little Apple of Death,” and the explorer Ponce de Leon was killed by indians with a dart laced with toxins from the manchineel tree. Source, Gulf by Jack E. Davis, Liveright Publishing, 2015. Where is a manchineel-laced arrow point (never read it was an atlatl point) that is purported to have resulted in the death of Ponce de Leon, documented in the early Spanish literature? Why is there not a worldwide effort to eradicate all poisonwood and manchineel trees? They are an important part of the food web of the tropical forests where they are found. White-crowned pigeons, which are endangered in Florida, and certain other birds rely on their deadly-to-us fruits as their primary food source. You’ll find poisonwood along the Florida Keys Overseas Heritage Trail, the Golden Orb Trail in Long Key State Park, trails of National Key Deer Refuge, at Pennekamp State Park, Key Largo Hammocks Botanical State Park, Windley Key State Park, and throughout Everglades National Park on the trails off Main Park Road. Manchineel is far less common but can be found in these places as well. Avoid touching either!